MuzikMan's Reviews And News: Legendary Violinist Darryl Way To Release New Concept Album/Rock Opera Called "Underworld"
Legendary Violinist Darryl Way To Release New Concept Album/Rock Opera Called "Underworld"
London - Much to the excitement of prog music fans worldwide, legendary Curved Air violinist Darryl Way is releasing a new Concept Album/Rock Opera called “Underworld” on June 21st. 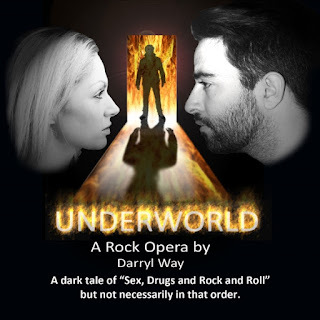 “Underworld” is released in 2 versions: “Underworld Rock Opera Complete” which is the whole show with dialogue and narration and “Underworld Rock Opera the Songs” which just contains the songs. After Curved Air Darryl went on to release several critically acclaimed solo albums in both 'rock' and 'classical' genres. Among these, was his 'Concerto For Electric Violin', which was premiered on the South Bank Show with the Royal Philharmonic Orchestra and himself as soloist. He also performed this concerto live on German television with the Bravarian Radio Symphony Orchestra and in England with the Northern Sinfonia. Darryl's collaborations include working with Sir Tim Rice, Sting and Gary Brooker (Procol Harum). In classical genres he has orchestrated Stewart Copeland's ballet “King Lear” for the San Francisco Ballet, and Stewart's opera “The Holy Blood and Crescent Moon”, premiered by the Cleveland Opera in the US. In 1996, Darryl's own opera “The Master and Margarita” was premiered at The Place Theatre in London. Alongside these projects, Darryl has also worked as a film and television composer. As a violinist, Darryl has lead the London-based Electric Symphony Orchestra for concerts at the Royal Festival Hall, and lead and recorded with The Elektra Ensemble, performing classical and contemporary music. As a session musician, he has recorded with Jethro Tull, Sky and Marrianne Faithful. He has also played with the National Philharmonic Orchestra on film scores such as “Die Hard”, “Licensed To Kill” and “Baron Munchausen”. Recent work includes being musical director for the soprano Emma Shapplin, for a series of televised UNHCR concerts at the Parthenon in Athens. Recent compositions include a Symphonic Choral work entitled “Siren's Rock”, premiered at the Plymouth Guildhall with the South West Sinfonietta, Opera South West, Naomi Harvey (WNO) soprano and Stephen Crook, tenor. During his illustrious career, Darryl Way has created and been a major part of over 20 commercially released albums. His most recent releases “Ultra Violins,” “Children of the Cosmos” and “Myths, Legends and Tales” have all garnered rave reviews worldwide! And now, he will be releasing his highly anticipated new album “Underworld”!